Taylor Made Pizza is a great place to grab a quick slice before heading to the library or after a long night out. Their slices are huge... they are 1/4 of an entire pizza. So it will definitely fill you up. Unfortunately, it is a little greasy at times and there really is nothing unique about their pizza. Also, their toppings can be from a can rather than the fresh deal... (mushrooms, olives, etc.) I find the crust addicting despite its cardboard taste... and for $4.50 for slice + soda... not the best, but not bad at all. Honestly, I have no idea why I added Bacon to this pizza. The grease level was unimaginable but it did still hit the spot. I did feel like I should run 10 miles after eating this pizza just to compensate for the fat intake... but either than that... I was content. The Cheese thin crust was nothing special... I had to add a ton of red crushed pepper to make it more pleasing... But it was my choice and I stuck by it... The cardboard crust was still my favorite part... Just try it and you will get hooked. I could honestly get ready of the pizza portion and just eat their crusts! 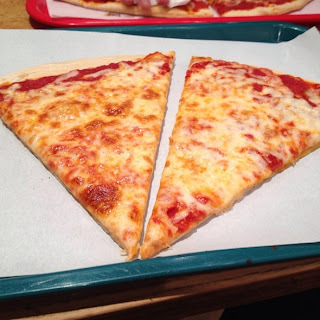 And by the way... That is one slice of pizza (they cut it in two to make it more manageable). - Do request your pizza NOT BE WARMED... 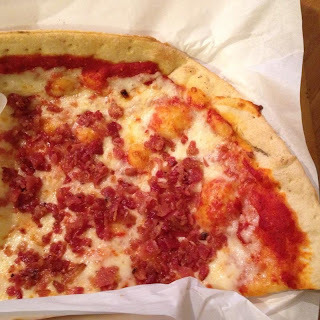 I found that the thin crust pizza is already warm from the circulating display and it tends to be less greasy when you do not have them warm it. - Don't forget to show your UIC ID... they give a small discount which is always better than nothing! Bacon and thin crust - that has the word, "crispy", written all over it. I guess it's time to let out the inner private chef bristol in me and see if I can't pull off my own version of that pizza.